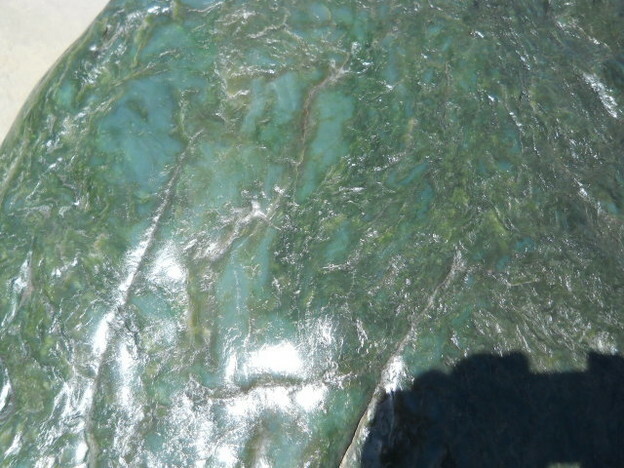 Gem grade nephrite jade boulder form Jade Cove California. Ultra rare blue green quality and no longer obtainable in this size. Asking $40,000. Call Rich at 805 423 3092 if interested. We have about twenty crates of premier rough rock. This was our rough material that has to go. Lots of old stock, Jade, agates, Jasper's, burro creek (purple), pertofied wood cut into 2 inch slabs. All from the old collecting sites and to much to list. Must be seen, will not be disappointed. Priced at .50 cents a pound or buy it all for a better deal.